The MIFE system uses a stepper motor-driven micromanipulator to move, in a "square wave", ion selective microelectrodes that measure the electrochemical potential of the ions at two positions in solution close to a tissue surface. The manipulator is obtained from a separate commercial source and a multi-electrode holder is needed if more than one ion is to be measured. Microsensors for neutral molecules may also be used. An amplifier, with 4-channel preamplifiers, provides the signals to the data acquisition card in a computer. The MIFE system will be used within a well equipped electrophysiology laboratory and a variety of other components (see below) are needed. The system can be used with the sample in a dish on an inverted microscope. This configuration is shown in a general view showing the MIFE hydraulic manipulator (outmoded version of the system) on the right. with an enlarged view of the manipulator. For seedling roots it is more convenient to use a standard compound microscope lying on its back, with the root lying in a vertical chamber on the microscope stage, as shown in this picture (thanks to Trevor Garnett) of a Eucalyptus nitens root for which 3 fluxes are being measured. Well equipped electrophysiology lab with bench and Faraday cage. Microelectrode preparation and filling facilities. Microscope with vertical or horizontal optic axis as required for the application. alternatively, Eppendorf PatchMan NP2 computer controlled micromanipulator. Multiple electrode mount in some cases. 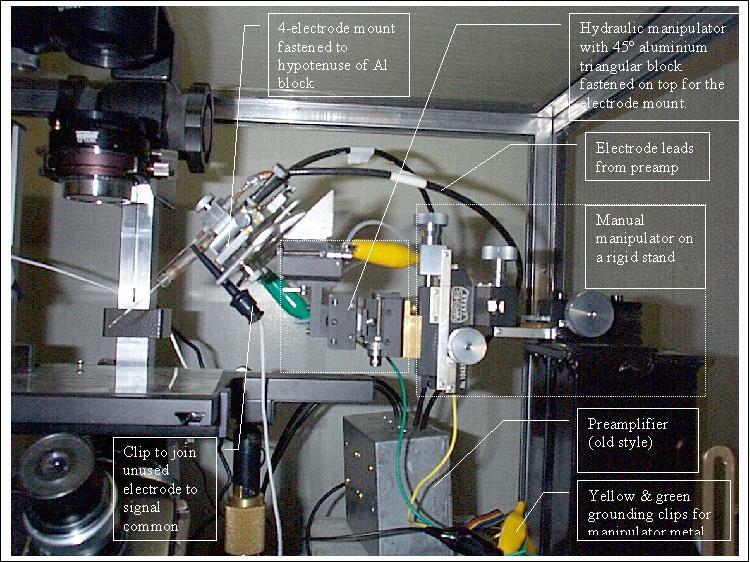 Manual micromanipulator for adjusting electrode or chamber position. Computer running Windows 98 or ME and having one ISA-bus slot (for the DAS08 card) with a spare slot beside it, with USB or network connection. General purpose software including spreadsheet. MIFE laboratory requirements. Many other things are needed for to measure ion fluxes. We have provided an outline of these requirements with estimates of costs and sources of supply. 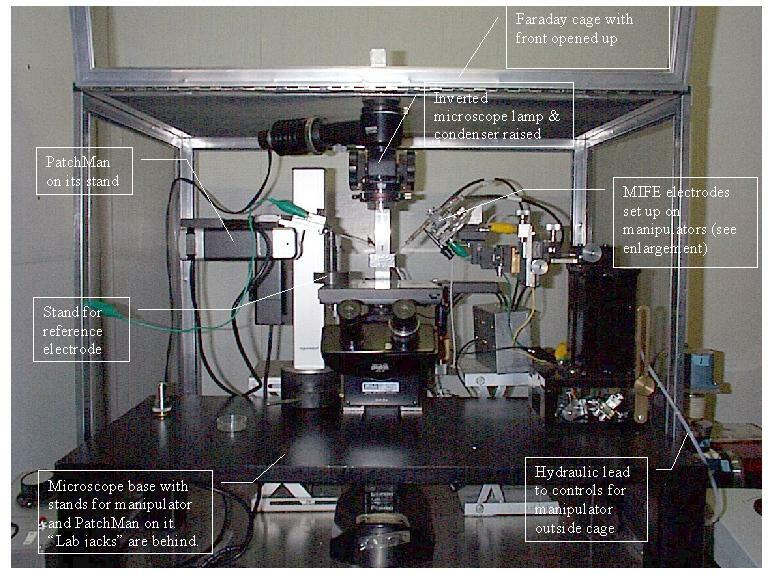 The MIFE setup is built around the microscope system with long distance objectives (200 to 500x total magnification). There are several basic configurations of the MIFE system used in our laboratory. When fluxes are to be measured from small specimens (single cells; protoplasts; bacterial monolayers etc), an inverted microscope is used. The ion-selective electrodes (usually, up to three) are mounted on a multi-manipulator providing 3- dimensional positioning. Typically, we use WI 64-0918 electrode holders (SDR Clinical Technology, Middle Cove, Australia) held in a MMT-5 or SM-17 (Narishige, Tokyo, Japan) micromanipulator. This allows fine positioning of the electrode tips near the specimen surface. The MMT manipulator is attached to the stepper motor-driven 3-dimensional hydraulic micromanipulator (Narishige WR-88 or MHW-3 models). This enables the square-wave electrode movement to measure the electrochemical potential of the ions at two positions in solution close to a tissue surface. Additional flexibility in electrode positioning is achieved by mounting the MMT-5/MHW-3 ensemble on a Narishige MX-2 mechanical micromanipulator. Instead of the MHW-3, the MHW-4 single-axis may be used. The measured specimen is immobilized at the bottom of the open type experimental chamber. 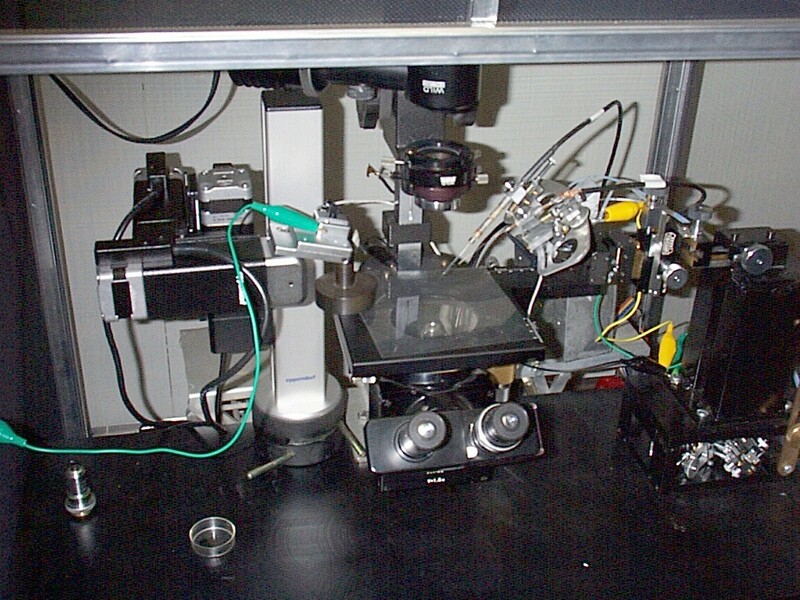 The chamber is placed on the microscope stand, and electrode holders are positioned at an angle of 30 � to the microscope stand plane. The standard non-polarizing Ag/AgCl reference electrode is positioned in the chamber. The electrodes oscillate (usually at 0.1 Hz), between two positions, close (usually 10-20 mm) and more distant (40-50 mm) from the cells, driven by the computer-controlled stepper motor. The voltage output from the electrodes is amplified by the MIFE electrometer and digitized using an analogue-to-digital interface card (DAS 08, Computer Boards Inc., USA) on an IBM-compatible PC. The interface card is also used for offset adjustment of the four-channel electrometer. The computer controls the stepper motor drive of the manipulator. The DOS-based CHART (University of Tasmania, Hobart, Australia) software package is used to control data acquisition by the MIFE hardware system. This software allows automated and interactive real-time control of the amplifier configuration and the micromanipulator while the data are being collected and written to disk (Shabala et al. 1997). The system configuration is recorded together with the data, and all modifications during data acquisition are recorded in a log file which can also include annotations typed during the experiment. The recorded voltage traces are displayed on the screen in a real time scale, with a possibility of expanding or contracting some selected data segment without interrupting the measurements. 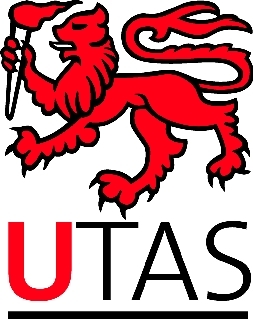 Flux calculations are performed automatically by the MIFEFLUX software (University of Tasmania, Hobart, Australia) from the data and log files. Calculated ion fluxes (in nmol m-2 s-1) and concentrations are exported into an ASCII-format spreadsheet and saved onto computer disk, alongside the raw (mV records) data. For ion flux measurements from root or leaf surface, a more �user-friendly� arrangement is used. In this case, the MIFE setup is built around the standard stereomicroscope. The microscope is rotated by 90o, so that the optical axis is horizontal. The measuring chamber is mounted on the computer-driven 3-dimensional hydraulics micromanipulator, while microelectrodes are held by the MMT-5 manipulator. Under such an arrangement, the electrodes are steady, and it is a slow movement of the measuring chamber that enables flux measurement. The main advantage of this arrangement is the convenience of electrode positioning (much further from the chamber�s bottom � thus, less danger for electrodes to be broken). For more details, refer to Shabala and Newman (1997).